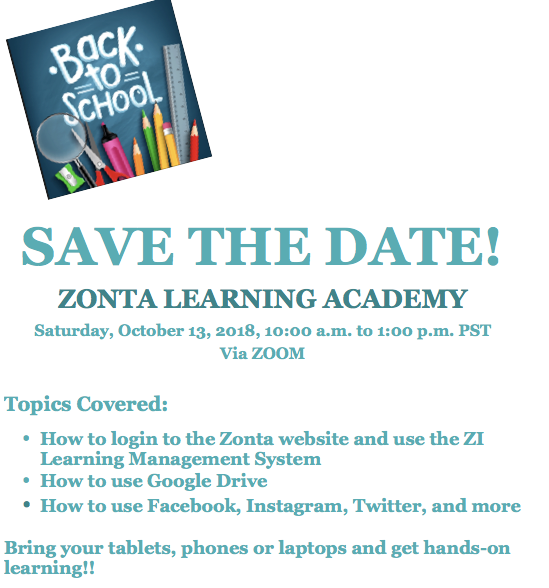 Mark your calendar for the District 8 Zonta Learning Academy on Saturday, October 13th, 10:00 a.m. PST. Rather than having a district wide meeting in a specific location, we are trying a different training method of reaching more members without the members having to leave their home club. The Learning Academy will give members the training and information needed to make all our clubs more effective both externally and internally. and Social Media (Facebook, Instagram, Twitter, etc.). Club Presidents, we are asking that you or a delegate find a location to host your club and that the location has good internet or Wi-Fi connection. The plan is use Zoom, a video conferencing online system, and for it to be effective the connection with the internet must be good. Additionally, members who attend are encouraged to bring their laptop, tablet, or even phone to access and practice the subjects being taught. Locally, the Corvallis Club will be looking at using a classroom at Corvallis High School. You may have a local school or community college that is available. I’m looking forward to this experiment and hope you will be able to join us. I’m also looking at an incentive for the club or clubs that can get the most percentage of members to attend. More on that later. This entry was posted in Operations, Training. Bookmark the permalink.